Why the Cain boomlet, and how long it will last? Good question since every Republican had their day in the sun only to come crashing back down when a second look merited it. Right now the most popular Republicans are those not in the race, and of course that most feared of candidates, Generic Republican! The problem is that one has to run a real live candidate and not Mr. Generic and certainly, there is nothing generic about Herman Cain. I once observed that watching Cain give a speech is like being part of a revival with even the most cynical politicians yelling hallelujah, and it is not often that you have political pros and activists start whooping when Cain gets going full blast. Just to hear him simply say, “In America, everyone has a right to succeed!” is worth the admission. 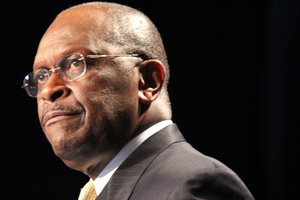 Cain is not a politician, and there are times that he reminds us of that. During a debate, Cain answered a question on foreign affairs by simply saying he would put together experts to deal with problems. He acted the part of a businessman gets the experts together and designs a solution, but in foreign affairs, most voters would feel comfortable with a President who already has an idea of how to handle world problems before he becomes President. Cain managed to get away with this just as he did when he did not know the true meaning of the right of Return for Palestinians as part of the Israeli-Palestinians peace negotiations. He simply admitted, “I don’t know everything.” Somehow, I could never imagining Romney getting away with that answer, but Cain has so far managed to do that. I suspect that one reason is that Cain is a likeable person, and there is a refreshing Horatio Alger aspect to his life that people like. After being governed by supposedly the smartest President we ever had, many voters might simply find it refreshing that there is a politician who is simply modest enough to admit, "Hey I don’t know everything, but I do know what needs to be known when running a country.” As a Indian writer once observed, modesty is a virtue in a Democracy, and Cain is a modest fellow who knows that there is much to be learned and understands that there are certain things that a President, or for that matter, a government can accomplish in a market economy that sees billions of transaction on a daily basis. Cain needs to take his proposal beyond the marketing 9-9-9 by showing that lower flat tax combined with a sales tax will lead to a collection of more revenues as opposed to the present system. Yet the proposal does make sense since it does broaden the tax base while ensuring that even GE will pay taxes and Warren Buffet's poor secretary will pay the same rate as her boss. Another aspect of the Cain's candidacy is that he has dispensed with the big staffs and depends upon small group of cadres. He treats his campaign as a startup company, hires staff who can multi task and add pieces as the campaign raises more money. Unlike other campaigns who hire the expensive consultants, Cain depended upon his own instinct and that of his staff, including his campaign manager, Mark Block. Mark Block is one of those campaign managers, who has cut his teeth at retail politics in Wisconsin and thinks outside the box; just like his boss. Both men view 2012 as that unusual transformational campaign that calls for different tactics. While other campaigns fight the last elections just as many Generals fight the last war, these two have developed an insurgent campaign to last over the long haul. Cain has transferred his marketing skills to politics and his experience as a talk radio host has exposed him to the common folks; giving him the experience of doing retail politics via radio. Cain may not win, but he has done something else; he has shown that a Black conservative can succeed on a national level, supplementing the local successes of South Carolina's Tim Scott or Florida's Allen West. This could bode well for Republicans as Cain’s successes shows other black conservatives that they can succeed, plus it will encourage Republicans to start promoting their ideas to the minority community. Tom, you are correct! Mr. Cain is indeed an unusual candidate. I had an opportunity to meet him last week and ask him a couple of questions. I will post my impressions of him and those questions tomorrow. Thanks for your view of this interesting American. Herman Cain is the candidate of We the People. Poll after poll Cain and Paul WIN. The Grand Old Parties (BOTH) and their lap-dog media response..­.make excuses, pay empty lip-servic­e and dismiss the ‘crazy crop' of supporters and their cash poor champions. Had either or both of the 'Rino twins' (Perry And Romney) won those same polls the ‘newsies' and party bigwigs would be so giddy they wouldn't be able to stop spewing accolades. Wake up king-maker­s. We the People are making it as plain and simple as we can... poll after poll after poll. We know you are bummed-out over OUR choices. We know you think YOU know what's best for us. But alas...we don't want your party invertebra­te champions/­the 'twins' or Obama. We'll make our own call. We think it is you guys that are WAY OUT OF TOUCH with reality. You think it is 'deep-pock­ets' that will 'buy' this race for the POTUS? Everyone knows the Rino twins and Obama have 'all the money'. So what. We choose to vote for the men and women w/fresh ideas that will save our Republic FROM those types of ‘self-serv­ing public servants’. We are very tired of lousy leadership­, a ‘gamed’ tax system and idiotic intrusions into our personal lives. 49% supporting 51% is a bad deal and clearly doesn’t work. Look around...W­orst economy since the GREAT DEPRESSION­....working on $15 trillion in debt...and way too many people without jobs. an­d the 49% should be responsible­ and pay for all the bad decisions made leading to this??? Think again. Herman Cain and Ron Paul offer real solutions and common sense. They are adhering to the Constitution and the principles of our founding fathers. The 'system' has been subverted and/or high-jacked by special interest, lobbiest and delusional/narcissistic leadership. Good for them...BAD for our Republic. The proof is all around us. Open your eyes and minds. If by 'unusual' you mean honest, hardworking, and personable...you are correct sir. If you mean not part of the 'past' failed political system and instead part of the 'future' common sense solutions and bold ideas political system...you are again correct. Clearly BOTH parties, in the last 60+ yrs have 'served' us into economic ruin and despair. The Tea Parties and the people in the streets now are symptoms of deep distrust of big government and Wall Street. The proof of 'system failure' is all around us. Cain wasn't part of that. He and Paul are winning poll after poll after poll. People LOVE Herman Cain (and Ron Paul). Cain's '999 plan' followed by the Fairtax will be a game changer for all of us. People will have control of their own finances and destinies. You'll not be punished for productivity the way we all are now. Unbridled growth and prosperity will be the 'rule'...not the exception. The GOP better get on board the Cain train if they really want to BEAT OBAMA. All the other fine GOP candidates will hopefully get positions on his cabinets and committees. Then we can get 'We the Peoples' business done. What an inspirational, authentic and honorable man. Keep the subject on the issues instead of just pointing fingers. . . Solutions instead of whining. . .what a concept for a leader to have. Go Mr. Cain. .. I'll proudly call you Mr. President!